WARNING — this is a lot longer than my normal modest posting. It is also a complex and troubling issue worth commentary. The questions of woman and men, violence against women, patriarchy, equality vs. complementarity, have beenon my radar recently. The world still waits to see what will happen to the kidnapped Nigerian schoolgirls. Closer to home people are grappling with the violence perpetrated by Eliot Rodgers against women and men but in the context of a manifesto against women that has echoed around the world. My Twitter feed has been filled with heart-breaking, soul-baring, and shocking revelations by women about the violence and misogyny they have experienced (If you are on Twitter, the hashtag for these posts was #YesAllWomen. If you didn’t see it, you need to take a look). As a husband and the father of both young adult women and a teenage boy I have a conflicting mix of emotions and thoughts. We have taught our girls to be independent and stand up for themselves. Both of them have faced violence from boys they dated who thought it was fine to behave in such a way. Thankfully nothing like the things I have seen and heard on Twitter of late. But a frightening and troubling in and of themselves. What are you teaching your sons in word and example, so no women is ever speaking of them when they tell their stories of harassment, fear, danger and violence? I couldn’t have said it better myself… but I have not said it myself enough. Nor, and this is where I feel the conviction of the Holy Spirit, have I examined my life and marriage and parenting and relationships for these insidious and corrupting ideas. Where have I perpetuated in humor, for instance, these beliefs that lead to violence? Where do the things I say and do reinforce the views that allow men to do such horrible things to women? Have I done them myself ? Not at the same level of violence but in word and silence? I am not sure I like the answers. There is more to consider here and I thank the aforementioned colleague and friend for dialoguing with me a bit this morning. She always makes me think and I am seeing where some of these issues of power, position, control, etc. are bigger than this question alone. This glorious beginning very quickly falls to pieces. Far too often we have lived in the story that follows rather than into God’s desire to renew and redeem and restore this heritage that comes from our very being made in the divine images – men and women, male and female. God spoke and it was so. Too ofter we – I – have lived out of the Old Adam’s tale rather than the New Adam of Christ. Continuing my thoughts from this original post, I have been thinking about the journey of faith. It is always a step-by-step progress. A day, a step, a moment at a time. It’s hard to admit but sometimes I want to go back. I want an easier way, one with fewer demands, more centered on me and what I want. (Full-time ministry complicates this reality to be sure but it is more about being a Christian than a pastor). I wish that I could just do what I want. But the path of Christian discipleship doesn’t have a U-turn. Following God never has. The people of Israel couldn’t go back to Egypt – but they sure wanted to return. But we can’t go back because we aren’t the people we were when we started. We can’t unthink, unexperience, undo what has brought us to the next step. And God is not behind us. God does not live in the past but in the present. In the next step. Not always comforting and sometimes overwhelming. But true. Take the next step… God is there. In a world before GPS (and still in Boy Scouting and other outdoor groups), people learned to navigate in steps. 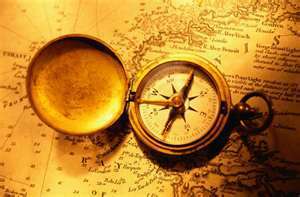 In orienteering, for instance, you would navigate using a compass and map from point to point. No electronic map to show the route from start to finish… no rerouting on your phone if you get off course. There is no spiritual GPS – God has not upgraded. The journey of faith is a step-by-step one. A journey that demands we focus on the steps before us. We know the destination (which is, by the way, a Person rather than a place – more on this later) but at the moment we aren’t there. We only know the points that we have traveled and the point toward which we are traveling next. For Christians, the Bible, the traditions of the church, our faith communities, the still small voice of God’s Spirit are all spiritual orienteering tools. Our compasses and maps. Our destination is God Himself. This metaphor humbles me. I can’t know where others are on the map. They may be following a different set of points. Their map may be different even if the destination is the same. They didn’t start where I did (nor did I start where they did). It also means that the journey right now matters. I can’t get to where God leads me without traveling point-to-point-to-point on the route. Shortcuts end up leaving me lost or confused. Wherever you find yourself today on this journey, attend to the steps you are taking. To the next point you are trying to reach.